Watford Plantation Shutters from Just Shutters, your local shutter experts. Shutters provide your home with the practical and beautiful alternative to curtains and blinds. Our shutter expert Tom Parrott (pictured below) brings unrivalled service and expertise. Call 01727 221298 for more information. The low maintenance and practical side of shutters will mean you enjoy the benefits for many years to come. While the beauty and style mean that whatever time night or day, you can enjoy the perfect ambience in your room. So whether you have an expansive view from a large window you don’t want interrupted by bulky fabrics, or you have a small porthole window you want to make the very most of, or any type of window in-between, we will design and install the perfect solution to suit you. For a visit from our Just Shutter expert call us on 01727 221298. Alternatively, request a brochure. 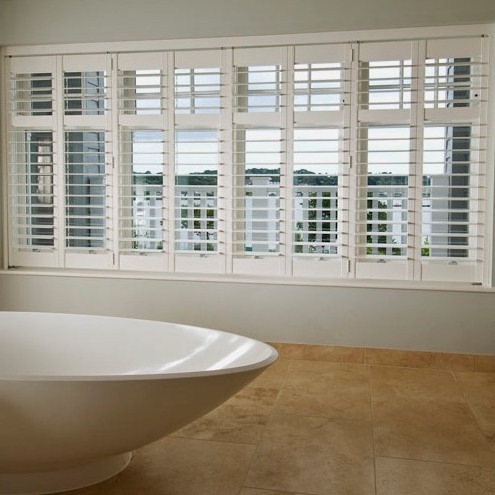 To get inspired about our Watford Plantation Shutters please browse our stunning shutter images. Just Shutters offer the widest range of styles, colours and shapes in the UK. Please see our extensive range of options from the menu above. See our galleries for inspiration and call your local shutter expert for a personal quotation now on 01727 221298. Or follow the buttons above. Really pleased with the overall quality of the design and installation of the shutters. One set of triple fold plantation shutters, one set of bi-fold plantation shutters. Careful attention to detail, so professional. Same person specifies, measures, fits and adjusts. Good produce, good service so would recommend. Shutters fitted to bedroom and lounge. Superb service and excellent overall result which exceeded my expectation. So 10 out of 10. Shutters fitted to our main bedroom. Excellent overall service! Delivered on time. Exemplary fitters. I had shutters fitted in two rooms. The shutters look amazing and the fitters were so very professional and their tidiness was outstanding. Very happy customer. I would so happily recommend this company. Installation of shutters to upstairs bedroom. Absolutely excellent all-round service. From product knowledge, to quote, follow up and installation. First class overall.